The players and stories that defined the first day of Nationals! MILWAUKEE, WI– Day one of the D-I College Championshps in the women’s division featured several high profile upsets, a lot of wind ball in mildly windy conditions, and some promising glimpses at the division’s best teams. Here’s what our women’s reporters saw on the ground. Tia Esposito (Michigan) is a playmaker, plain and simple. Esposito operated in Michigan’s backfield today, slinging hucks and smooth under throws with confidence and ease. On defense she earned several key blocks for Michigan, especially in their final game with Carleton. Emma Berrigan (Texas) is a freshman, but she’s already contributing a veteran level of effort and results for Texas Melee on Friday. Berrigan was a favorite deep receiver for Domenica Sutherland and Laura Gerencser, and in their zone she proved to be a tough playmaker. Nhi Nguyen (Colorado) left clutching her hamstring just a few points into their second round matchup with West Chester. Nguyen has struggled with her hamstring all year, and it looked like one of the big stars of the division’s tournament was over. Instead, she came back in played in their second game of the day and wound up catching the game-winning goal on double game point against UCSB. Lindsay McKenna (West Chester) led the division in combined assists and goals on the tournament’s first day. She tied for the division lead in goals with eight and tied for the second most assists with 12. Her West Chester squad went 0-2 on the day, but McKenna racked up the points all the day long. Bridget Mizener (North Carolina) played an excellent day of ultimate. This sophomore scored three goals in their game against UBC, and her tough cuts kept defenders on their toes throughout the day. Lakshmi Ilango (Pittsburgh) had two goals and three assists in their game against Florida and a measurable impact on defense for Danger throughout the day. Sarafina Angstadt-Leto (Oregon) had a phenomenal Friday, even as her team fell short of expectations. She saved a number of “uncatchable” passes and was frequently in the right spot for Oregon. If they’re going to make it out of Pool D, Oregon will need great performances from players like Angstadt-Leto. When Briana Campbell (NC State) is locked in, she’s one of the most lethal offensive and defensive players for her club. This was on full display in their game against Oregon. But a muted performance against OSU showed the other side of the coin. Ashley Powell may be the central figure on NC State, but Campbell may be the most vital. In the third round of Friday pool play, Texas played their best version of their game and UCSD did not, and that lull cost UCSD their fourth loss of the season and likely the free ride to quarters that comes with a pool win. Texas’ big zone and their concentrated offensive efficiency was more than enough to wrench breaks out of the UCSD starting seven. Texas’ tall cup, anchored by one of the division’s best marks, Laura Gerencser, surrounded UCSD handlers Kelli Iwamoto and Samantha Wool and lulled them into throwing through the middle where athletic Texas defenders picked off the disc. On a turn – of which there were many as the game progressed – Texas flowed with the confidence of a team who has been here many times before. Texas only allowed UCSD to score three points in the first half, a remarkable feat given this San Diego team’s regular season. UC San Diego found their footing in the second half, but their own zone barely ruffled Texas’ handlers movement. Laying down the law in Pool B today, Melee reminded the division that they know how to play in the big show when the clock is running. Carleton was 2-0 against Michigan coming into pool play today, but Michigan Flywheel reversed that trend in the final round with a double game point win 13-12 against Carleton Syzygy. The upset created a three-way tie between Texas, Michigan, and Carleton that these teams get to sort out on day two of pool play. Michigan launched into the game with high energy. They broke twice to open the game, and they held at least one break through the entire game, even as Carleton fought back to tie the game late at 11-11. These teams were well-matched in their depth and their play style. Seven players scored Michigan’s 13 points, and seven players scored Carleton’s 12 points, while nine women threw Michigan assists and six threw Carleton’s goals. Michigan and Carleton each threw some zone, but their talent was clearest when they played matchup defense. While Carleton’s Anika Thomas-Toth and Michigan’s Brittany Wright had great games, the full rosters for both teams are the reason this game went to double game point. This late day matchup was a clash of two deep, skilled teams who are peaking at the right time. Today, Michigan was the team who took away the win. Byers made one of the greatest grabs of the season in West Chester’s defeat by Colorado in round two. Lindsay McKenna’s huck floated a bit over her head, but Byers was able to track the disc in a tough position directly under it. From a near standstill she laid out and stuck out her off-hand to make the grab. Unfortunately for her team, they couldn’t turn the spectacular play into a significant swing of momentum, but the catch was one of top plays across both divisions on day one. NC State set an early precedent with their 15-11 victory over Oregon. Jaga came out of the gates firing, and set the tempo of the game within the first few points. On the other hand, Oregon’s offense looked like they were still waking up. A sluggish start should not have buried Oregon, but NC State showed remarkable composure throughout the game, and Oregon couldn’t get the breaks they needed to make the game competitive. The lower seed gave up only two breaks to Oregon, and slowed the game down to a pace that stifled Oregon’s defense. Instead of rushing their shots, NC State looked for the safe upline or break side passes, never opting for the risky throw. Oregon’s attempts to prevent downfield passes allowed easy resets that NC State was never afraid to take. Without a worry of getting off a safe dump pass, they were free to find openings downfield. For NC State, this was a great victory that put the rest of the pool on notice. For Oregon, this loss put them at a disadvantage for the rest of the weekend, and they’ll now have to play a perfect Saturday just to make it to the bracket. Before Nationals, Stanford’s record was a tidy 35-4. But if you take a closer look, you’d realize that half of their losses came from one single team. Oregon was the one team that Stanford had no answer for, and while their games against Fugue were close, Oregon matched them in a way few teams could. If Stanford had any concern leading into their Friday game against Oregon, they didn’t show it. Even after Oregon stole an early lead, Stanford doubled down on their fundamental offense and took back the game one point at a time. Nothing Oregon threw at Stanford could slow them down. Whether zone, person, or poach defense, Stanford seemed unperturbed. Carly Eckstrom had a particularly good game, lasering discs around Fugue’s zone and finding receivers through the tightest of margins. On defense, Stanford reasserted themselves as a premier defense and exposed Oregon’s penchant for floating hucks. With the wind on their side, Stanford’s zone defense made Oregon throw some ambitious shots, many of which sailed out of bounds. Shayla Harris and Julia Butterfield both came down with some impressive skying blocks and Oregon couldn’t apply pressure downfield in a way that forced Stanford’s defense to play out of their comfort zone. Pool C was upset-free on Friday, but that didn’t mean everything went according to plan. 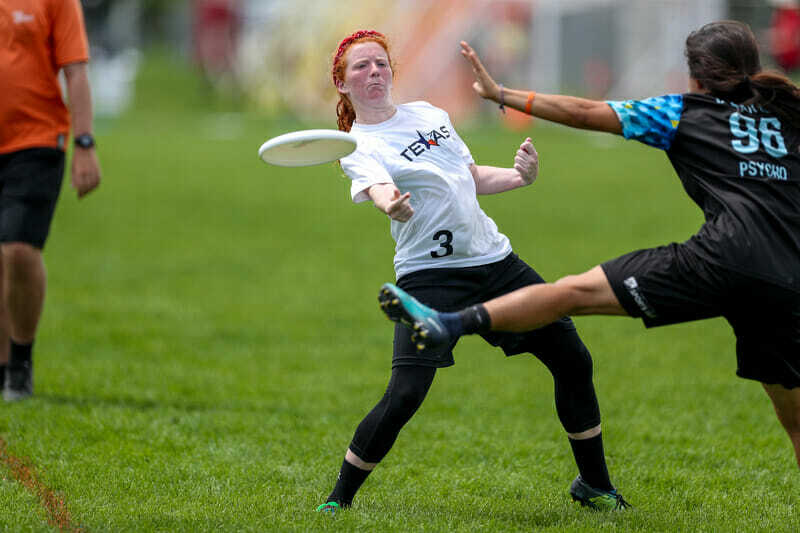 North Carolina may have cleaned out British Columbia 15-6, but it didn’t come without a price: Jenny Wei, Pleiades’ Callahan nominee, could not compete in their game against Florida. It was apparent UNC was missing a vital part of their team at the beginning of the Florida game. The Pleiades defense couldn’t convert after multiple Florida turns, and that kept the game close for the first eight points. Without Wei, UNC looked less dynamic and threatening on offense after the turn. UNC flipped the script in the second half. Whether it was Wei’s return to the sideline, or their offense figuring out FUEL’s zone, UNC played a completely different game. The team sped up their pace and used their depth to calm Florida’s fiery play. Wei looks set to return for Saturday, but UNC has proven that they can earn a bye to quarterfinals with or without her. While UNC was rolling through the pool, Whitman and Pittsburgh faced off in a game that was easily the best contest of the pool. Both teams relied on a small core of players to generate flow and get the offense moving. Pitting Carolyn Normile, Hannah Blizzard, and Jessie Sun against Alissa Soo, Linnea Soo, and Chloe Carothers-Liske brought out the best and worst from both teams’ stars. And yet it was the role players from both teams that kept the game interesting. Miranda Kosowsky and Sarah Russek both stepped up to bat for Pitt and pulled them through the game defensively. They combined for eight blocks, and in a 10-8 victory, those blocks matter all the more. Despite impressive play from both sides, it was Pitt’s dominance in the air that won them the game. Pitt came down with some 50/50 shots that Whitman desperately needed. Sun was especially important for their defensive plays, and chased down a few blocks that she seemed to have no chance on until the very end. Pitt ends day one with two wins, but their real test is against UBC and UNC tomorrow. If they can continue to play sharp defense, it may just be enough to earn them the first upset of Pool C.
It’s a full on battle for second place in Pool A between Tufts and Colorado. Colorado is currently undefeated, but Tufts has already played their game against Dartmouth while Colorado has not. It’ll likely come down to the game between the two of them, though Tufts does need to avoid an upset at the hands of UC Santa Barbara in their first round game matchup. Will Dartmouth continue to steamroll the pool? In all likelihood, yes. They won their two games over Tufts and UCSB by a combined score of 30-10, so there’s little reason to worry based on their Friday performance. But they do have a matchup with a highly-experienced squad in Colorado and a West Chester club with elite athletes at their top end. It was on Saturday last year that Dartmouth suffered a shock defeat to Oregon. That loss obviously didn’t impede Dartmouth from winning a National title, but they certainly aren’t hoping to play an extra game in prequarters this time around. If none of their games are intriguing, though, there may be an interesting internal battle to follow. Caitlyn Lee led the team in points with two goals and 10 assists. Few would have picked her to lead the team in that sense before the tournament with competition in Jaclyn Verzuh and Julianna Werffeli, but to start the tournament, Lee showed that there may be a top three leading Dartmouth right now, not a top two. Pool B had two upsets resulting in a three-way tie between UCSD, Carleton, and Michigan. Carleton faces a tough road tomorrow in order to stay in contention: they play UCSD and Texas to finish pool play. If Michigan can surge past Western Washington tomorrow, they earn a spot in prequarters. UCSD didn’t play cleanly in their first game against Michigan, and their loss to Texas is lightly ringing some alarm bells for their tournament ceiling. Their play tomorrow will tell us more about where their heads are at this weekend and how far they can go. When a team relies on seven to nine players for 90% of their game, they can’t afford players having an off game. Many team’s narratives tomorrow hang on how they play Pittsburgh Danger, the tournament No. 10 seed. North Carolina and Pittsburgh are each 2-0, and they’ll face off in the second round on Saturday. Pittsburgh battled through a tough fight with Whitman on Friday, and they’ll have to prove their depth and defensive creativity if they want to frazzle North Carolina’s top seven. British Columbia struggled today against North Carolina, but they’ll have a chance at redemption in their final game of pool play against Pittsburgh Danger. UBC and Pittsburgh haven’t played yet this season, but the winner could get an easier seed in prequarters, which isn’t small beans for two teams with big ambitions for this weekend. No one could have expected that Oregon would finish Friday with two losses and zero wins. Fugue looked good all year and hadn’t suffered a loss against any team in their pool. Now, they’re staving off bracket play elimination and will need to beat Ohio State and Cornell handily to even make prequarters. Ohio State Fever had two comfortable wins on Friday, and played incredible lockdown defense. But those wins were over the two lowest seeded teams, and OSU’s biggest challenge is yet to come. With games against Stanford and Oregon, OSU will really have time to prove they belong in the bracket. Comments on "D-I College Championships 2018: What We Saw On Day One (Women’s)"